Yeah, ok so S2 Games is making a second MOBA. Having seen Strife, I can certainly see that S2 hasn’t built a MOBA to compete with HoN. The two are destined for completely separate audiences. HoN is a dark, gritty MOBA with advance mechanics, while Strife possess a sarcastic “Dark Pixar” appearance making it fun (see Wizard Cat champion) but accessible. S2 isn’t setting out to make Strife a competitive MOBA nor are they trying to introduce a severe skill curve. Instead Strife aims to promote team play and cooperation while diminishing the importance of mechanics that take you out of the action for long periods of time. Similar to League of Legends, a high priority is placed on last hitting and remaining in the lane as long as possible. 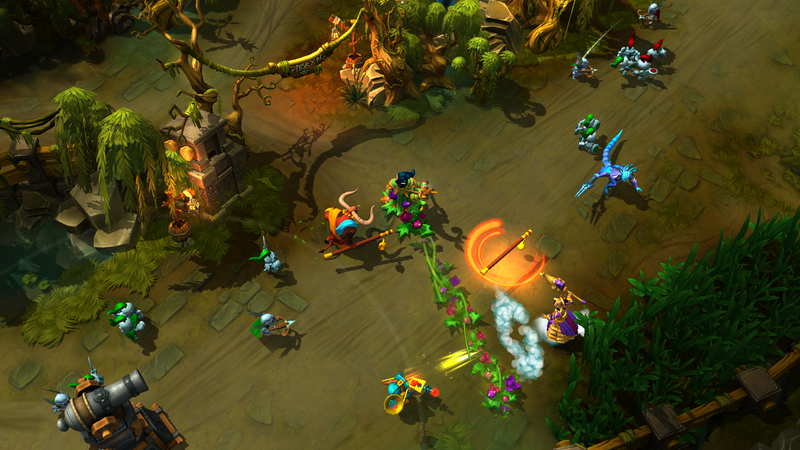 However unlike LoL, Strife provides additional mechanics to further help players maintain their lane presence. This includes vastly increased regeneration of health and mana outside of battle and a personal un-killable courier for each player. The most significant change however, would have to be how gold is distributed between players. 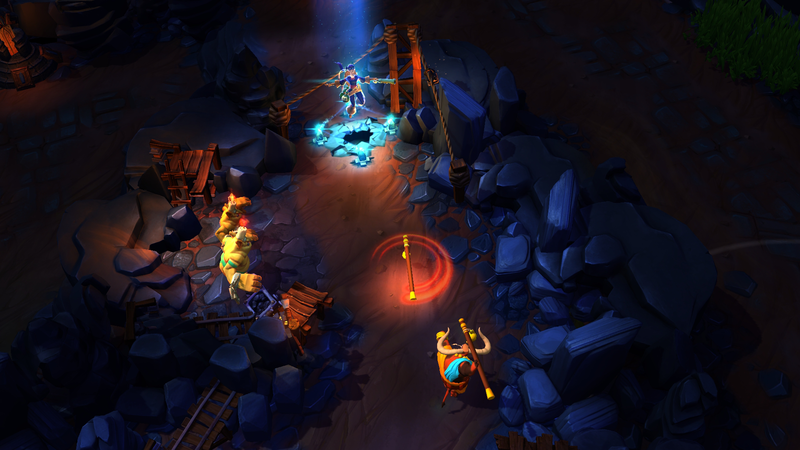 Last hitting is an important mechanic in Strife, because it provides team-wide gold bonuses depending on how many players are near the last hit. If a player happens to have a solo lane extra gold will be globally split across the entire team. If two players are present in a lane, a minion worth 70 gold will have its bounty split in two, with both parties receiving an equal portion. This is especially useful in lanes with a support since it nullifies any gold disadvantage due to a lack of cs. Speaking of supports, there are no wards in Strife. Instead players can find fixed observation towers which function similar to those found in Starcraft 2. Players can touch the tower in order to gain team vision for 30 seconds. 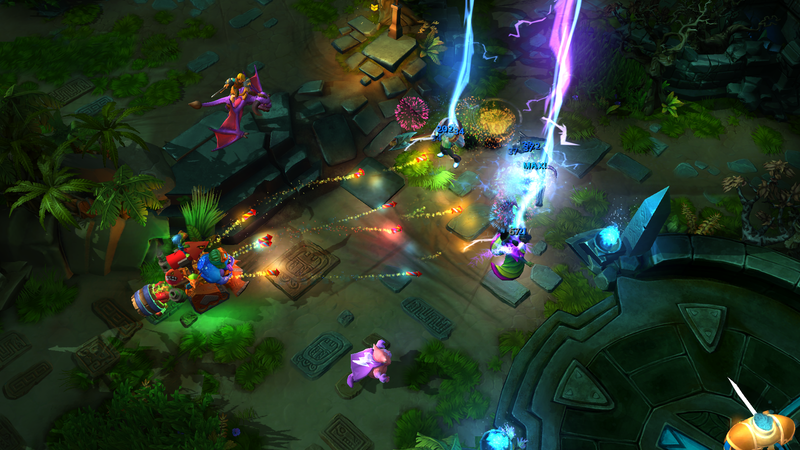 If an enemy player touches the ward after, the ward will switch ownership and the timer will reset. As you can imagine, this in addition to brush encourages aggressive ganking since observation towers can only provide small windows of protection in limited areas. The equal gold distribution coupled with a personal courier means players will have constant access to new items. Even someone who personally does terrible will still have gold to spend in order to keep themselves on par with their team. Other quality of life improvements include a dedicated boot slot which frees up an additional item slot and prevents players from purchasing too many boots. The boots themselves come in a variety of styles which can give stat bonuses or provide unique actives such as the ability to leap or teleport. Using active items is also made easier in Strife. S2 Games mentioned players often forgot an item they purchased had an activatable ability. In Strife, whenever a player purchases an item with an active, the active ability appears on the player’s hotbar. The items themselves are also worth mentioning since Strife features a surprisingly fresh take on item recipes. How often have we desired an item’s active, but refused to use it due to its stats? In Strife, players can choose to swap out the components which make up a recipe in order to custom tailor the item’s stats. The item’s final cost must remain similar, but the new item will retain the recipe’s unique properties. This opens up unique opportunities for players to craft one of a kind items which perfectly fit their desired build. S2 has stated each champion within Strife can be built numerous ways and even mentioned “Support Carries” were a common sight in the Alpha. Crafting your style of play in Strife begins before the match begins. Players select their champions before queuing, which then prompts matchmaking to attempt and place them with other players who have selected champions that fill other needed roles. Playing a game of Dota 2 with five carries can make you want to do terrible things to your keyboard, so if this feature works as advertised it could reduce player toxicity by a large margin. Further customization options include the new pet system found in Strife which offers several benefits. Each pet offers unique passives, Scar for example provides an activatable decoy and grants additional attack speed and lifesteal. Barrior on the other hand provides active healing, increased health and can periodically save the player from lethal damage. Each of these pets can level up independently and their appearances evolve as they do so. The rest of Strife follows in line with most other MOBAs. A tri-lane setup with towers, waves of minions, a jungle complete with two bosses, and a nexus to destroy makes for a very familiar experience. The addition of Krytos, a giant white gorilla, does add a forced teamfight element however. Upon killing the main boss, players will free Krytos gaining him as an ally. Krytos will then push a lane on his own, dealing massive damage and preventing towers from firing back. This does however, raise some questions in regards to game length. Krytos could spell a quick end to some games where a bad team fight could lead to him pushing several towers. Still, for being in Alpha, Strife is already very polished and felt responsive. S2 Games has clearly taken cues from what they did wrong with HoN and are attempting to create a MOBA which doesn’t attempt to reinvent the genre, but provide fresh takes on familiar mechanics. All the while attempting to entice those who’ve perhaps shied away from MOBAs in the past due to their perceived huge learning curve. I agree I want a beta key aswell. I did not knew much about this game, but after reading this article i can say i am very interested about Strife now. The pets, item customization and item actives added in hotbar sound really nice. Not very sure i like how that Gorilla works. From what i understood it disables the tower attack. That makes it very hard for the defending team. Not to mention it says, it also deals massive damage. A 5v6 against a team that is probably already ahead doesn’t sound to good. On the other hand i am also curious how the towers that act as wards impact the game. I can’t say im a big fan of the “wards war” for games like LoL, and i am also not very delighted about the way wards work in Dawngate for example (some well placed ward basically make your lane impossible to gank, since they cannot be destroyed). 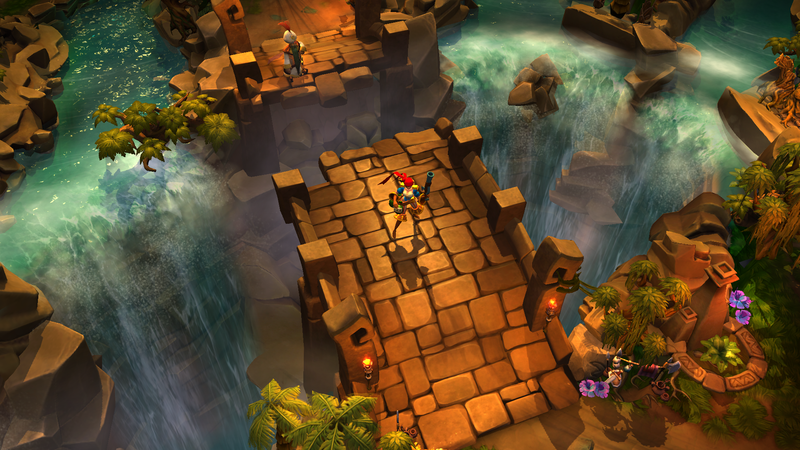 Even though the wards in Dungeon Defenders 2 for example, work the same as in LoL, i feel like i liked those more, but that is just because of the 3rd person camera. The gorilla is supposed to make team fights happen, but the gorilla will only attack the tower, unless a hero decides to attack it before it gets to the tower, this makes it easier for the attacking team since the tower now is disabled and makes for a fair team fight and it makes games shorter and more accessible to more people. The trade off of having ape is that it is very weak against players attacks but when it comes to taking out towers it packs a punch. Basically the team that gets it has to keep it alive to force a push through the selected lane, which will force players to either work as a team and defend their ape or use it as a decoy against the opposition. cool stuff. 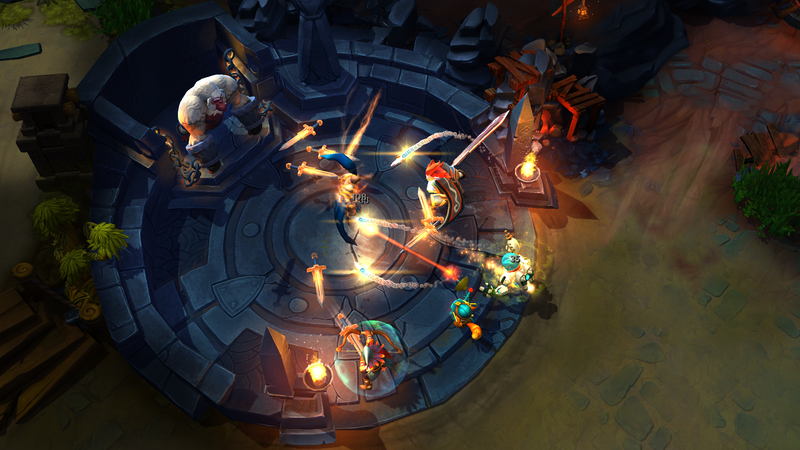 looks like another moba that resembles more like League.